Notes from a conversation with her granddaughters in the late 1960s record that Sarah Rees came from Victoria, Ebbw Vale, Monmouthshire and had Bevan ancestry. The granddaughters believed that Sarah's father (but not her mother) had emigrated with a group to the USA and that explained the relative lack of knowledge about the family. Sarah's birth certificate records her father as Rees Rees and mother Margaret. An interpretation of censuses between 1841 and 1861 indicates that Rees Rees and Margaret Beavan (c.1811-) who married at Aberystruth, Monmouthshire on November 20 1836 (witnessed by William Lewis and Elizabeth Phillips) were probably Sarah Rees' parents. Margaret is likely to have been the daughter of Meredith Bevan (c.1786-1854) and wife Jane Bevan (c.1782-1866, maiden name unknown). This interpretation also indicates that Sarah had sisters: Mary Rees (c.1838-1841) and Jane Rees (c.1840- ). See Rees Rees of South Wales, Illinois and Iowa for detailed information on his ancestors and descendants. In the 1851 census, 9-year-old Sarah Rees is described as a niece, (born in Monmouthshire Bedwellty) in the household of Meredith Bevan (1807-1889) a 46-year-old iron puddler (born Breconshire Llandefalle) and wife Hannah (47) (born Glamorgan Merthyr) - probably Hannah Thomas (1804-1882, married 1828 Aberystruth) - in Augusta Street at the Victoria Iron Works, Ebbw Vale. There is also a lodger Richard Thomas aged 18, born Newport, Monmouthshire. In 1861 the situation remained the same except that birthplaces were given slightly differently: Meredith (55) from Brecon Cwmdu; Hannah (57) Glamorgan Dowlais; Sarah Rees (boarder) (19) Monmouth Victoria; Robert Thomas (lodger) iron puddler (23) Monmouth Ebbw Vale. Meredith Bevan was probably a deacon of that name in the local Bethel Congregational (Annibynol) chapel. Confusingly, in 1851 another (older) Meredith aged 65, a labourer born Brecon Cwmdu, wife Hannah (68) born Brecon Talgarth, sons Thomas (38) unmarried puddler born Brecon Llangunider, Jonathan (34) unmarried puddler born Brecon Cwmdu, are with daughter Jane Watkins (widow) (24) born Monmouth Aberystruth. In 1861 this family is without Meredith and widow Jane Bevan had two granddaughters with her: Jane Rees (21) and Margaret Bevan (16), both laundresses (presumably in the neighbouring laundry) born Monmouth Bedwellty, the parish including the Victoria Iron Works. 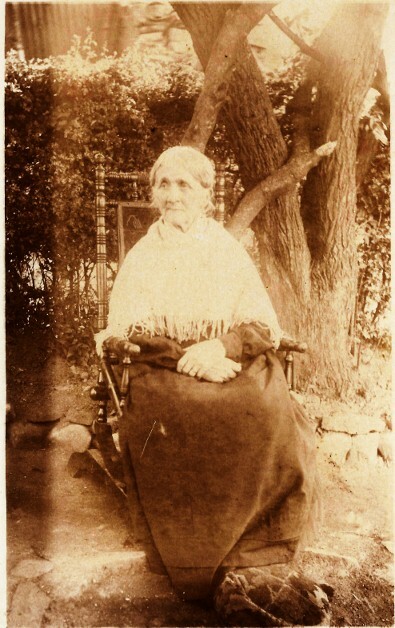 The older Meredith Bevan died in 1854 and Jonathan Bevan in 1867. 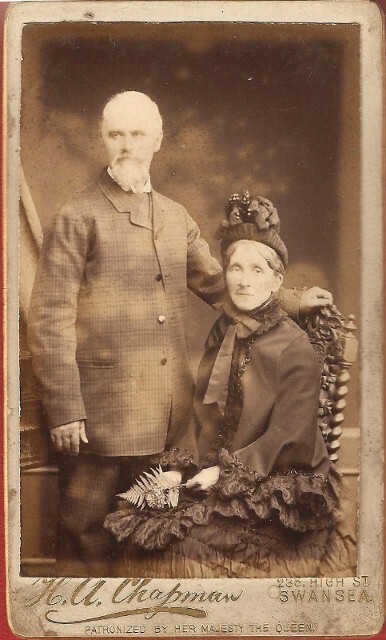 Jane married Thomas Lewis (1839-1890, born Tonty'rbel, Crymlin) (also known as Thomas ap Lewis) on August 1 1864 at the Registry Office in Newport. 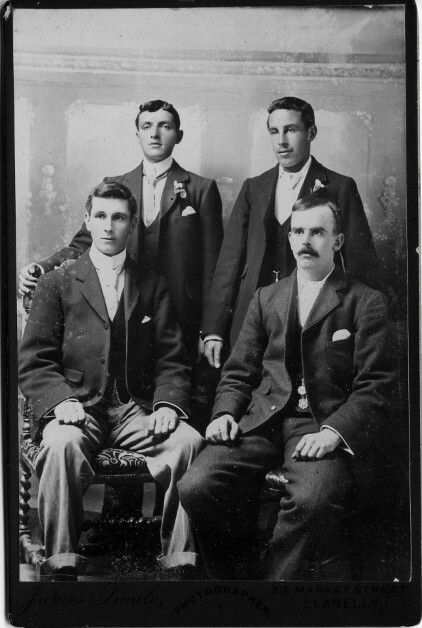 They had Llewellyn Goronwy Lewis (1866-1903), Edward Lewis (1869-1872) and Edward Lewis (1872-c.1932). Llewellyn Goronwy married Elizabeth Mary Pegler (1861- , born Nantyglo) and died in Weymouth, Dorset. 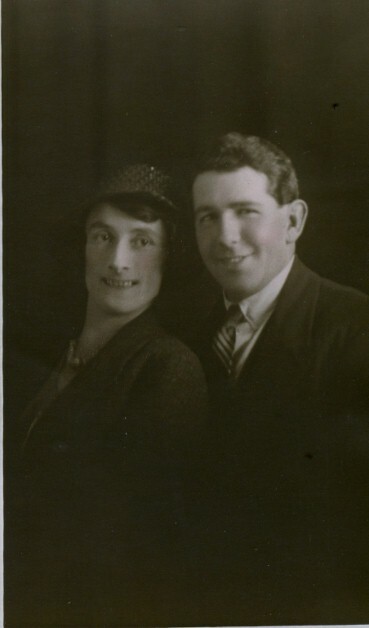 Their only son Goronwy Claude Lewis (1895 - 1931, born Weymouth, Dorset, died Cauld, Victoria, Australia) wed Eunice Anne Thomas (1896- , born Swansea) in Llangyfelach on June 14 1922 when he described himself as a mechanical engineer. During World War 1 Goronwy had served in the Tank Corps and achieved the rank of Major. Llanelli-born Samuel Jones (1843-1917) appears to be the son of John Jones and Mary James. The most likely marriage for Sarah and Samuel Jones took place at Zoar Baptist Chapel, Ystalyfera on August 13 1870 when her father was given as Rees Rees. In 1871 Samuel and Sarah were living in Contractors Row, Ebbw Vale with son Jonathon Jones (1) born Monmouth Bedwellty (registered June Quarter Bedwellty as Jonathan Rees). Their next-door neighbours were listed as Thomas Beavan (57) Labourer born Brecon Llangynider, Jane Bevan sister (44) widow born Monmouth Aberystruth and Margaret Bevan, niece (25) born Monmouth Bedwellty. 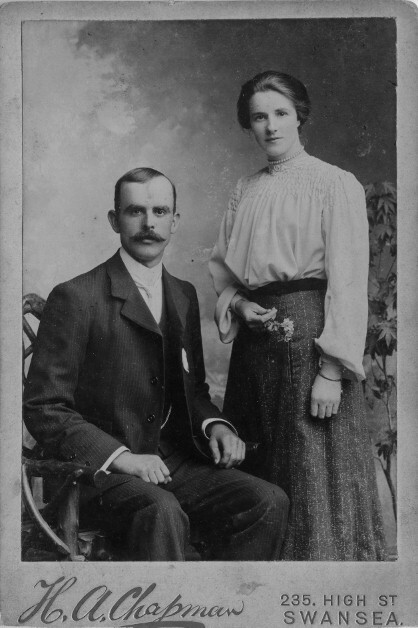 In 1881 Thomas Bevan (66) born Rhymney and Jane Bevan (55) born Nantyglo appeared not to have moved (same neighbours). Thomas Bevan died in 1887 aged 73; Jane Bevan is alone in 1891 and died in SepQ 1898 aged 72. In the 1881 census Samuel and Sarah were recorded at 'Pantyffynon', in the parish of Bettws, Carmarthenshire. The names of the adjacent properties indicate that this was in the Glanaman area, not the more familiar Pantyffynon near Ammanford. Samuel was shown as a 38-year-old Rail Engine driver, born Llanelly with wife Sara (39), and children Jonathon R. (12), Margaret (9), Mary (7) (all born Ebbw Vale) and Thomas (3) and Meredith (2) (born Carmarthenshire Bettws). In 1891 they had moved to a nearby property, Penwaun, where Samuel is recorded as a stationary engine driver. Sons Thomas and Meredith are coal miners. Margaret J. was then married to James Thomas (21) also a coal miner, both living at Penwaun (see Thomas Family of Banwen farm, Glanaman). Jonathon was recorded as a Railway Foreman lodging in the house of Henry and Annie Morgan at Gurnos, Ystradgynlais with mother Sarah a visitor. 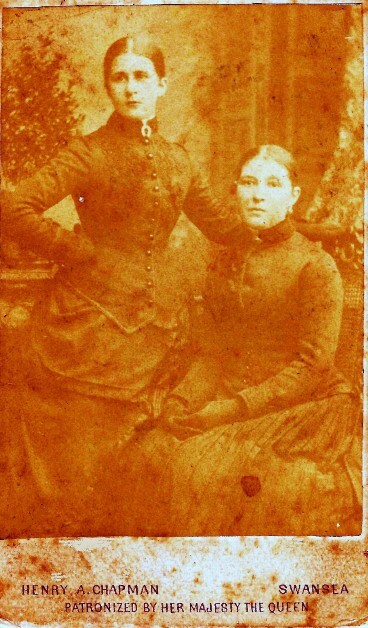 Mary (Polly) was recorded with Sarah's sister Jane Lewis in Penmaen, Monmouthshire. By 1901 they had moved again to Grenig Cottages when Samuel remained an engine driver. 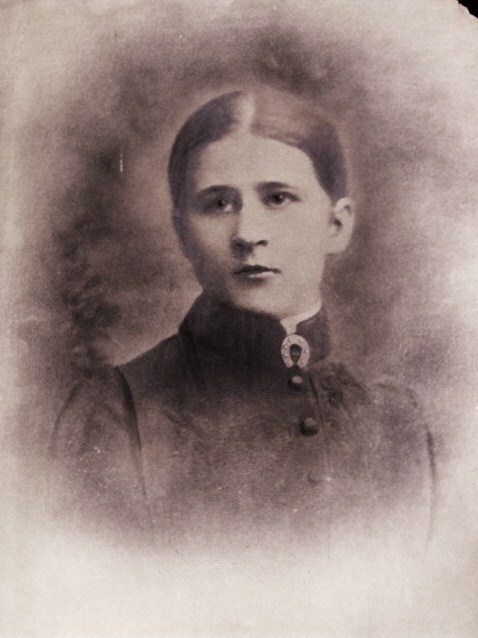 Margaret Jane had died of tuberculosis on 4 January 1896 and one of her daughters Elizabeth Ann Thomas (8) was living with them along with Polly (Mary) and Thomas (Tommy). They had a new house 'Brooklands' built on Cwmamman Road (now 128). Polly died of TB on 9 March 1906. Neither Polly or Thomas married - he died in 1956. Olive and Jonathon Jones. 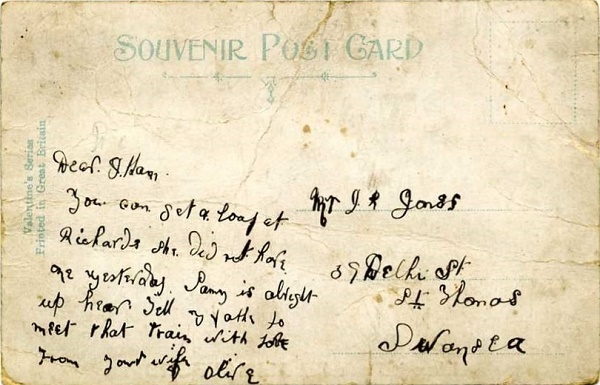 On the reverse is written: 'J R Jones, 39 Delhi Street, St Thomas, Swansea'. 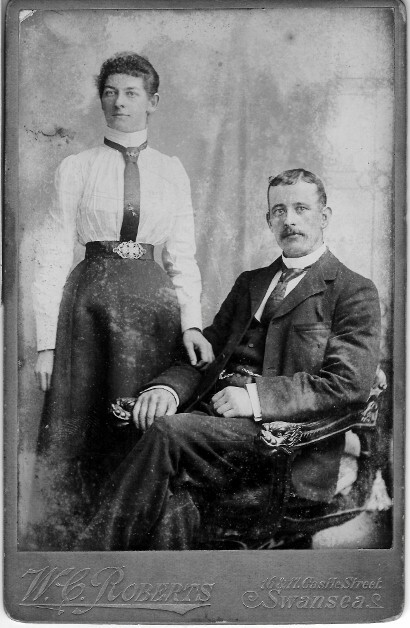 Jonathon married Olive Myra Hanlon (1882-1964, also known as Olive Morgan) at the parish church in Swansea on April 16 1903, witnessed by John Hanlon and John Richard Jones (Jonathon's first cousin - see The family of John Jones and Mary James). Olive appears to have been the daughter of William Morgan (c.1856- ) and Mary Jane Kelly (1858- ). 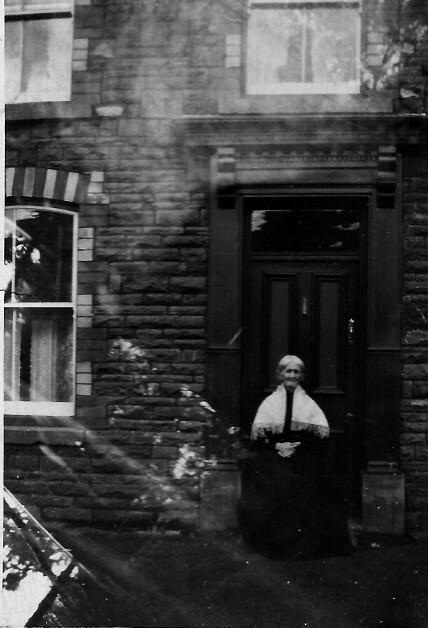 In 1901 she and her mother were living as Hanlon with father John Hanlon (c.1850-1923) in William Street, Swansea. Jonathon and Olive had: Olga Jones (1903-1908 - died of Meningitis according to family memory); Samuel John Jones (Sammy) (1904-29 October 1964) married Margaret Edwards (Maggie), no children; Olive Myra Jones (b.1906); Meredith Jones (1910-2002 - known in the family as Winston) married Harriet Treharne (1914-2000) and had children. Jonathon was admitted to the Asylum at Talgarth, Breconshire on 22 March 1911 and died of 'TB of the brain' (according to family information) in Talgarth on 17 January 1913. In the 1911 census Olive was at 39 Delhi Street, St Thomas, Swansea described as married for 9 years, 4 children with 3 still alive. John Hanlon, widower aged 59 having been married 32 years with one living child was a boarder, dock labourer born Manchester. With them were Olive Myra Jones aged 5 and Maud Evans 28, a cousin. 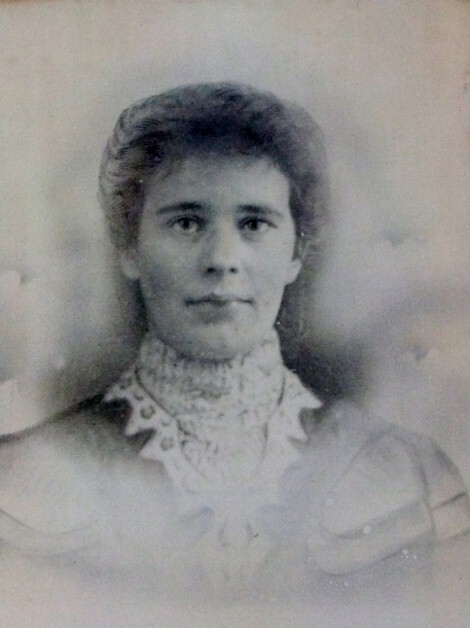 Samuel John and Meredith Jones were with Olive's sister Elizabeth Jane Morgan (1878-1962), her railway shunter husband George Spiers (1873- ) and the boys' grandmother Mary Jane Morris - probably Mary Jane Kelly/Morgan - in Port Talbot in the 1911 census. Subsequently, Sammy was brought up by his other grandmother Sarah Jones in Glanaman. According to family information Olive Myra Jones became a nurse in Fulham. In the 1939 Register she was a sister at the Pinewood LCC Sanatorium in Wokingham. An Olive Myra Jones, born November 8 1906, of Flat 10, Point Royal, Easthampstead, Bracknell, Berks died on 24 June 1969. Weekly Mail September 7 1907 - LOCAL WEDDINGS. JONES-THOMAS. The village of Pensarn, near Carmarthen, was gay with flags and bunting in celebration of the first wedding solemnised at Babell Calvinistic Methodist Chapel, which has recently been restored. The contracting parties were Miss Margaret Thomas, only daughter of the late Mr. John Thomas, of Pensarn, and Mr. Meredith Jones, son of Mr. Samuel Jones, Glanamman. 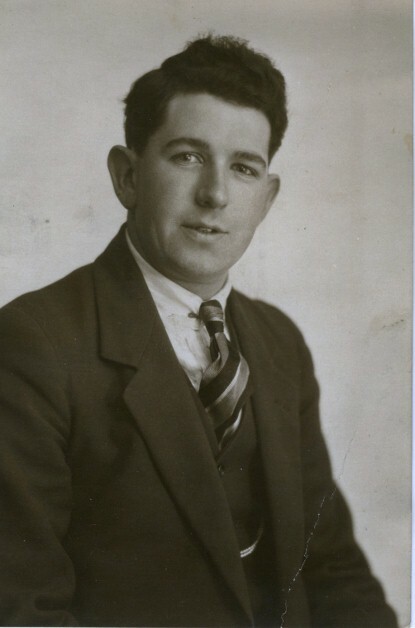 Meredith, A GWR engine driver, married Margaretta Thomas (Geta) (1885-1937) in Carmarthen and had at least one child, John Samuel Jones (Jack) (1909-1991) (b.24th February 1909) who became a policeman and lived at 106 Trinity Road, Aston, Birmingham. Meredith's retirement is mentioned in the Amman Valley Chronicle of May 18 1939 where he is described as a 'royal train driver' having commenced as an engine cleaner in the Garnant shed in 1894 and retired from the Carmarthen shed after 45 years service. He drove the Royal Train to Pencader in summer 1937. (source: www.tytwp.plus.com). Meredith's probate gives his address as 16 Mansel-street, Carmarthen and date of death as October 10 1942. Probate was granted to John Samuel Jones and Leah Margaretta Davies (wife of David Oswald Henry Davies, 1908-1980). Effects £1076 2s 3d. Leah appears to have been a niece (Margaretta Thomas) living with Meredith in the 1911 census and the 1939 Register.